A fresh and flavourful side-dish that's packed with protein and full of green goodness. Stir together quinoa, orange juice, water, cumin, coriander seeds and 1/4 teaspoon salt in medium pan on high heat. Bring to boil, then reduce heat to low, cover and simmer until liquid is absorbed and quinoa is tender but still chewy, about 25 minutes. Fluff with a fork and let cool. Meanwhile heat oil in non-stick skillet on medium-high. Add only 1 minced clove of garlic, plus the white parts of the green onions. Cook, stirring, until fragrant, 30 seconds. Add peas and cook until heated through, about 2 minutes. Set aside to cool. 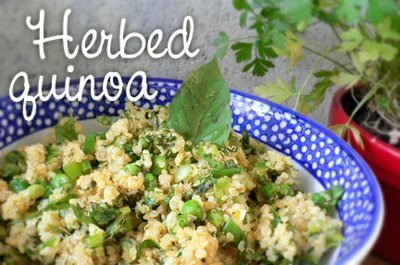 In a large bowl, gently combine quinoa, peas and fresh chopped herbs, green parts of green onions, and remaining garlic. Season with fresh pepper and remaining 1/4 tsp of salt, sprinkle with fresh lemon or lime juice, and toss well. Serve warm or at room temperature. Go nuts! This is a well-balanced tri-doshic dish that will make every Vata, Pitta and Kapha happy and healthy. I love this dish! I love it the first day and eating it for leftovers! Fantastic recipe!!! Soooo very flavorful. I omitted the garlic and onion, replacing it with appx. 1/4 teaspoon of asofetida to make it sattvic. Turned out wonderfully, thank you.